…is a leading cause of early death in adulthood? and dropping out of school, and other high-cost social problems (juvenile delinquency, child welfare, domestic violence and other violent crime, etc.)? The Washington State Family Policy Council and Department of Social and Health Services have put together a 3.5-hour online course called “The High Cost of Childhood Abuse.” Even the free preview busts a few myths, a major one being that our genes are the greatest influence in who we are and how we live our lives. Not true. 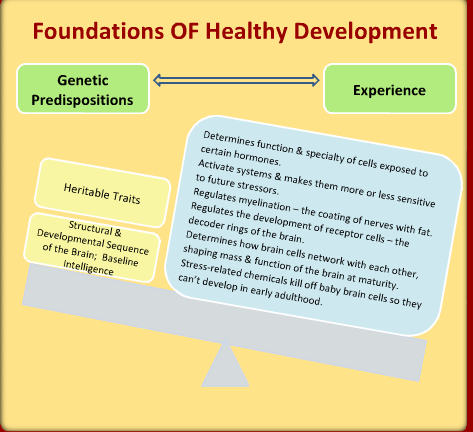 This course is a result of a 10-year journey into marrying the best scientific research on child trauma and child brain development with delivery of social and educational services in communities. People began applying the new knowledge in different settings: child crisis nurseries, juvenile justice departments, parent training, schools. When agencies and organizations began seeing an unmistakeable shift in how people were helped with this approach — decreases in school drop-out rates, fewer foster parents returning children, more successful turn-arounds with kids in the juvenile justice system, etc. — the demand for training skyrocketed. Eventually, word spread outside of the state, and even with 40 trainers, the Family Policy Council couldn’t keep up with the demand. Hence, debut of the course last October. “I hope it’s useful all over the country,” Porter says of the course. She sees it as a vehicle for organizations to take a different approach to our social problems, one that uses “compassion and inclusivity rather than judgement and rejection,” she says. “Some states frame the ACE Study as ‘people are broken’,” says Porter. “We frame it as ‘ACEs is a proxy for toxic stress’.” She points out that when children experience toxic stress for long periods, they regard the world as a place that’s always dangerous. They grow up with brains wired to react with fear or aggression to nearly all situations and people they encounter. But for most of us, our world is peaceful. And people who grow up without chronic toxic trauma can’t understand the behavior and responses of those who do. “Our society has to solve our problems by creating environments that don’t trigger them, that are more inclusive, so that we can reduce the prevalence of ACEs in the next generation,” says Porter. 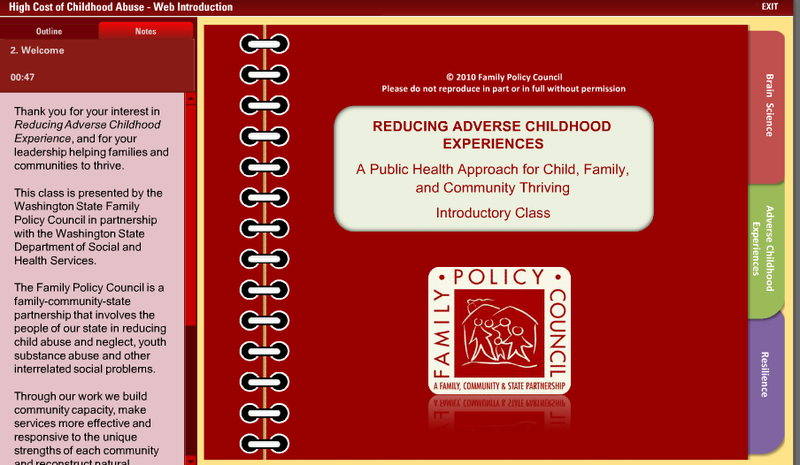 The course is organized into three segments: brain science, adverse childhood experiences, and resilience. “You will learn the prevalence and high-cost lifelong outcomes of ACEs, the vital role of culture and community to optimize wellbeing, and how to use this emerging research to create transformative conversations,” according to an intro on the course site. The course is flexible and easy to follow, costs $29, and is broken down into bite-sized chunks with useful graphics. You can jump around, replay parts, turn off the audio and read the narration. To go through the course, you’ll need the Flash player. If it’s not on your computer, it’s an easy installation that will take you less than five minutes. It’s designed for anyone with an interest in learning how adverse childhood experiences affect our individual and community lives. And for those who need continuing education credits (e.g., nurses, teachers, counselors and social workers), the course provides four. So far 50 people have independently enrolled in the course and the Division of Vocational Rehabilitation has purchased a block of 518 course enrollments for distribution to counselors and partners, says Sasha Silveanu at the Family Policy Council. Based on continuing feedback, the course is likely to be revised, she says, specifically to shorten the final section on resilience and perhaps create a second course on that topic.